A mother's love is on full display, as a bald eagle has gone to great lengths to keep her eggs warm. UPDATED: 8:45 a.m., Friday March 6: What a difference a day makes. Morning has broken, and the sun is shining in Hanover. It’s not clear which of the two eagles — Liberty or Freedom — is currently on egg-sitting duty, but all’s well. Earlier: 3:30 p.m., Thursday March 5: The mate of the snow covered eagle has returned to the nest. Check out the photos to see the transition as the second eagle took over egg-sitting duties. While a smudge on the camera blocks some of the view, the seamless switch was pretty amazing to watch. The two “love birds” made the transition in such away that their eggs weren’t exposed for even a moment. Check out the gallery to see a visual timeline. WASHINGTON — No one likes cold eggs. Not even the United States’ national bird. 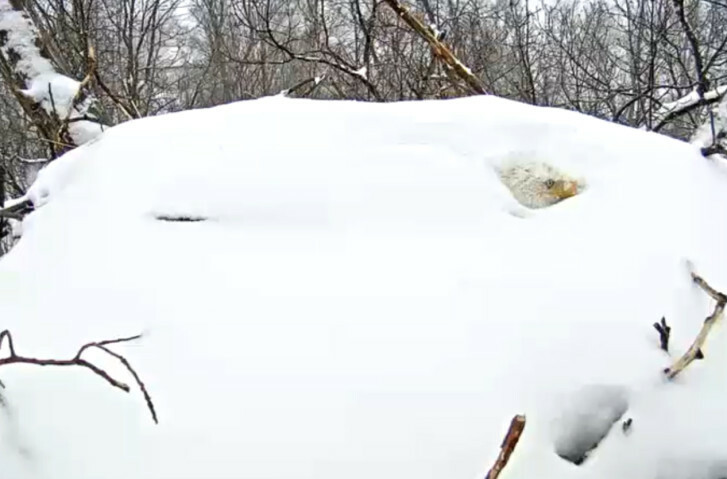 The Bald Eagle Live Stream in Hanover, Pennsylvania captured an amazing sight Thursday, March 5 as an eagle became covered with snow as it refused to leave its nest. Inside the nest were two eggs. Despite being so blanketed with snow that only its head remained exposed, the bald eagle was stoic. Occasionally, as the eagle’s beak became covered, it moved its head for room. But other than that, the national bird remained steadfast. Naturalist Jack Hubley tells LancasterOnline that there’s no need to worry about the eagle getting too cold. The feathers provide insulation. Since the eagle is covered in snow, Hubley said, it indicates the bird isn’t losing body heat. Click here to check out the camera while you can.